Just a little more than a decade ago, a member of Sal Khan’s family needed some help with school. Sal didn’t live nearby but leveraged the power of video technology to tutor them online. Other family members got wind of what Sal was doing, and so he shared the videos. More and more people started using the videos and behold, from humble roots as a side business, Khan Academy, a major player in online education, was born. You’d be amazed at the big businesses that you’ve heard of (and probably used) that, like Khan, started as side hustles. The idea of pursuing entrepreneurial and small business pursuits in non-traditional work hours has caught on recently in a major way. Mobile technology continues to ease the barriers to going into business. Now, just about anyone can take an idea and an iPhone and start pursuing their entrepreneurial interests in no time. It’s never been easier to find, communicate with and serve customers and clients, making the side hustle increasingly attractive to many people who also have a full-time gig. The only limit? Time. No amount of technology can extend the hours in a day. Side hustling can start out filling a major void, be it a desire to be creative, to solve a problem, or just to make more money. But as any business becomes busier, the owner finds there’s a limit to just how much they can do alone. Help has to be brought in, or things suffer. The business doesn’t run as it should, or the owner’s life starts to fall apart as family, friends, and other priorities get neglected. Yikes. Enter the virtual assistant. It’s probably no surprise that a VA is often the first line of defense side-hustlers consider as they start to grow. Sometimes people do it out of desperation as they start to realize how thin they are stretched, and certainly that’s a great reason to hire a VA. But what if you were a super-smart side hustler who actually got *ahead* of the game and automated your business with a virtual assistant from the get-go? Consider what life would be like if you grew a business from scratch while still enjoy your downtime. It’s actually completely do-able with the right virtual assistant(s). Imagine this: Instead of checking your email 12 times during the work day and 17 more before you go to bed, your assistant is handling all email communication, including responses, in a short chunk of time each day. You get alerted to the few things that only you can respond to, but otherwise, things happen behind the scenes and you don’t have to keep diverting your attention to your phone. Then consider: if you’ve shopped well for a Virtual Assistant agency, you’ve also nabbed a VA who enjoys social media marketing. So maybe she’s spent a couple of hours this week posting fresh content and curating applicable stuff to go on your social channels. The social media beast is getting fed and you’re not spinning your wheels trying to create graphics or say something clever. It’s already done! Now think about what would happen if you had another VA handling whatever bookkeeping tasks you may have. You forward receipts, invoices, and expenses, and quit trying to wrangle confusing accounting software. It’s being dealt with, but you’ve outsourced a major cause of stress. And fast forward to April 15th? Suddenly tax time is a breeze. Is it possible? You bet it is. Suddenly, with just a bit of outsourced work a week, you have your evenings and weekends back. Maybe you spend it developing products, streamlining processes, or shaking the trees for new business. Perhaps you get to actually enjoy watching your kid kill it on the soccer field, playing with the dog, or having undivided time out with your friends. Or maybe you just use it to eat dinner, work out, and do a little binge-watching on Netflix. Whatever, you’re the boss. 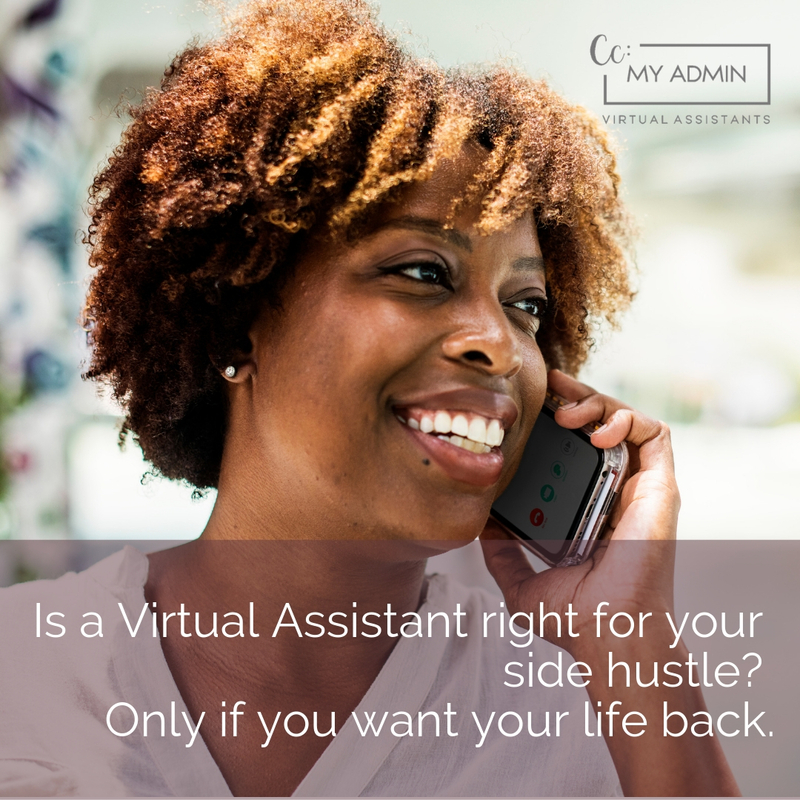 Either way, you’ve automated your side hustle in a way that means you can still have a life while the business hums along and the money rolls in. Side hustles are fun, fulfilling, and have the potential to make you big money. They tend to do something for us that a day job just can’t. But you don’t want to get burned out because of how much there is to do to make it grow. Consider how getting just a few of the things you don’t like off your plate can make that thing you are so passionate about sustainable. Will you be the next Khan Academy, Apple, or Under Armour? Only time will tell. But you’ll get a lot closer to finding out if you can keep the joy that made you start in the first place.